The 2 London concerts by Talking Heads at the beginning of December 1980 were the hottest tickets in town. Since the group’s debut LP in 1977 they had released an album a year without a false step. Talking Heads were many peoples favourite band & these gigs were the only UK shows on a European tour. Friends were calling from all over the country about the possibility of tickets but I’d been beaten to the punch & no-one I knew was pushing any spares my way. Two weeks before the concerts I got a call from Liverpool. Mark had begged, stolen or borrowed 2 tickets & as it was my birthday that week I was his plus 1. They were for the Hammersmith Odeon, an Art Deco cinema, all-seated, rather than across the road at the Palais (de Danse) a lovely custom built dance hall but you would hear no complaint from me. The new record “Remain In Light” was an impressive thing, an expansive, adventurous fermentation of Afro polyrhythms & funk-punk. The 4 piece group knew they would struggle to do these complex songs justice when playing live so they called for reinforcements. Guitarist Adrian Belew had played on “Once In A Lifetime”. Producer Brian Eno had seen Belew play with Frank Zappa then recruited him for David Bowie’s “Heroes” LP. Bassist Busta Cherry Jones had an Eno connection too. Bernie Worrell, keyboards, had been a key member of the Parliament/Funkadelic collective throughout the 70s. Percussionist Steve Scales & vocalist Dolette McDonald joined too. A bigger sound for growing audiences, they were going to need a bigger band. This should be good. Talking Heads first toured the UK as support to the Ramones, a CBGB’s double whammy that we all wished we had seen. A new distribution deal for their label Sire led to copies of “Talking Heads 77” being sold in a local newsagent for just £1 ($1.50 ). Our friend Roger took all they had & played Johnny Appleseed, giving out the staccato, angular rhythms matched with yelping, deadpan vocals to anyone who cared to listen. The UK is a small market, critical acclaim in the music papers, an appearance in early 78 on the “Old Grey Whistle Test” & the distinctiveness of “Psycho Killer” established the group as more than ones to watch. Their association with Eno for “More Songs About Buildings & Food” filled out the sound, made the pacing more assured. It’s a great piece of intelligent danceable pop music. There was a lot of that about in the early 1980s, not so much in 1978. The first 2 records made use of the songs David Byrne had written before they were recording. 1979’s “Fear of Music” is a dark, urban, claustrophobic even paranoid collection. A companion to its British contemporary the Clash’s “London Calling”, showing where we were at & that we would need to get serious in the coming new decade. I saw Talking Heads in Manchester after a particularly bad day at a strange time. Heavily self-medicated, immersion in this provocative music, crepuscular but not sombre, was the very thing. Six days later I was at the Electric Ballroom, Camden, that London. In a better mood, with better friends it was a great night. Byrne’s initial preppy diffidence was now replaced by an individual frontman style. That week I was convinced of the talent of Tina Weymouth whose bass pulse underpinned the music & tied the whole room together. It was one of those nights at the Hammersmith Odeon, the packed bar was buzzing with anticipation. It was great to be on the town with Mark. I had known him since he was at school & his animation studies at university suited the young man. We passed on the support, preferring to get loaded & to catch up. Anyway I’d seen them before & the plodding rock cliches of U2 didn’t appeal then & never have. We entered the auditorium, bagged 2 empty seats, front row balcony, not ours but no-one came to claim them & settled in. We got the early hits first, “Psycho Killer” & “Love > Building On Fire”, getting them out of the way I thought, this was a new band. The following 12 songs including 5 from “Fear…”, 5 from “Remain…” & of course their cover of Al Green’s “Take Me to the River”, were as good as anything I have ever seen played on a stage. Talking Heads had doubled in size but there was no clutter. That driving beat from Tina Weymouth & Chris Frantz, the husband & wife rhythm section, was still the means of propulsion. Jerry Harrison now had assistance on guitar & keyboards. David Byrne was free to lead the congregation, both on & off-stage, free to…erm…”dance” too. Adrian Belew, as you can see in the clips, was given all the scope he needed to strangle & choke amazing sounds from his guitar. It was the whole that was so impressive. The 9-piece band was an irresistible sonic juggernaut while never relinquishing nuance & subtlety. They took some great recorded songs & added value to them in the live performance. During “Once in a Lifetime” my mouth was as wide open as my ears. Music for the head, the heart & the hips. Great modern pop music. The band’s next moves included arena gigs, a big white suit, an in-concert movie, promos directed by Jim Jarmusch, Jonathan Demme & Wim Wenders. There was more show in the business & David Byrne became the quirky (dread word !) guy in those videos. For “Stop Making Sense”, the tour & the film, Belew & Jones had moved on, while it’s a fine document I prefer “The Name of This Band Is Talking Heads” a record of the band I saw. I didn’t go to their Wembley Arena gig in 1982, that’s too big a place. Despite a growing dispute between Byrne & the others concerning writing credits Talking Heads continued to create intelligent, interesting music on the 4 studio LPs released after “Remain…”. In 1981 David Byrne & Brian Eno collaborated for the “My Life In the Bush of Ghosts” record, a pioneering, provocative, delightful blend of oblique strategies & world rhythms which stands as a signpost for more musical genres than you can shake a stick at. 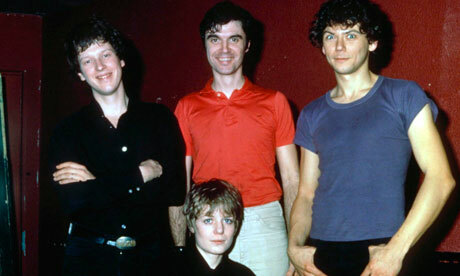 For a time, as the 1970s became the 1980s, Talking Heads were simply the best band around.